FLIR E6 is an infrared thermal imaging camera with MSX® Thermal Image Enhancement. Temperature range from -20 to 250ºC (-4 to 482ºF). MSX adds key details from the onboard visible light camera to the entire infrared image in real time to get an all-in-one thermal picture with numbers, labels, and other structural features. Variable emissivity and reflected temperature parameters for detection accuracy. Quick re-charge via USB style charger. Encased in rubber - 2 meter drop test. Download FLIR E6 Data Sheet. 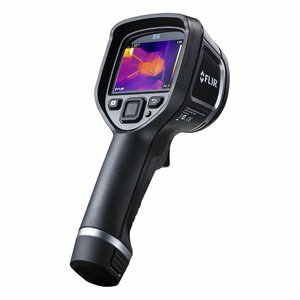 FLIR E6 Thermal Imaging Camera — 1 pc. Replacement battery — 1 pc. Power supply/charger with EU, UK, US and AU plugs — 1 pc. Hard Transport Case — 1 pc.